Sunny days like today, while waiting for the ground to dry from all the recent rains, gives me opportunity to open the honey bee hives and check their progress. 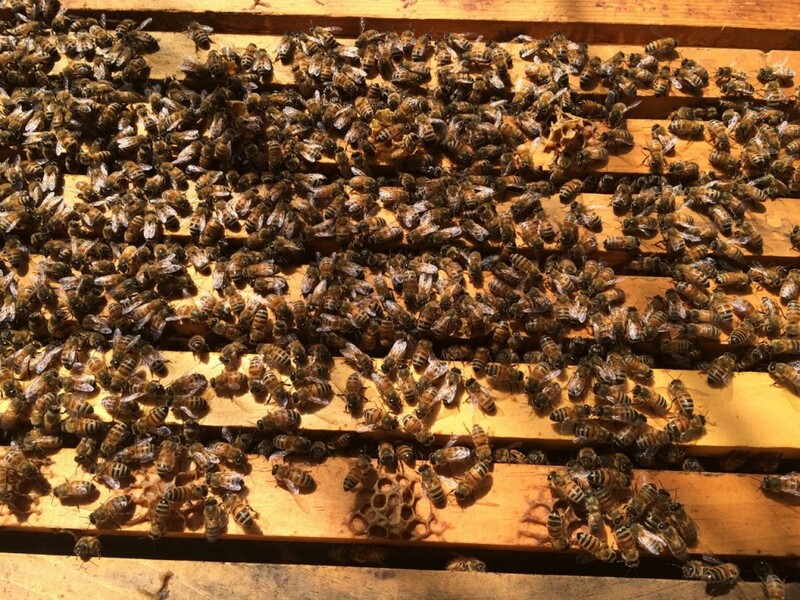 April and May are busy months for the honeybees on the farm. The queen bees are laying 2000-3000 eggs a day, worker bees are tending the larva and brood, field bees are gathering nectar and pollen for the hive. To successfully produce a honey crop, the boxes must be chock full of 40,000-60,000 bees. After coming out of the winter with 15,000 bees, the hive has a lot of young bees to raise in a short order. Nectar flow starts in mid April or first of May with the arrival of white clover. This year, with all the rain in April and cool temperatures, it is shaping up to be a great honey production season. The bees have a little extra time to build up their numbers and the main flow of nectar should hit mid May. At Delvin Farms I manage between 15 and 20 beehives for both pollination and honey production. We get a little honey each year but the main objective is for pollination of our organic vegetables and maintaining a hive that will last through the winter. I’ve been keeping bees for 5 years and it does get easier as experience has taught me what works and does not work. Raising bees is not easy because of all the non native predators and diseases that have moved into the area in the last few decades like verroa mites and hive beetles. The mites and beetles will kill a weak hive and /or at least cause severe stress. I do choose not to treat my hives with the commercial chemicals however and instead try to raise bees with genetics that can live in our area. 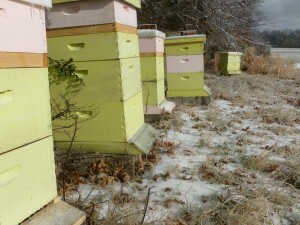 Each beehive has one queen which is hatched by the overwintered hives on the farm. Because she comes from existing stock, she should be able to survive through our winters in Tennessee, live in our humid climates during the summer and combat the natural predators. Since we have added the bees to the farm, we have seen a huge increase in the number of bees in the vegetable fields. Cucumbers, squash, pumpkin, blueberries, blackberries, and apples rely on insect pollinators like bees to fruit and grow a crop. We provide the flowers for the bees to feed and the bees in turn provide honey for us to harvest and benefit the plant by assisting the production of the fruit. Frame of honey bees with brood about to be hatched. Approximately 4000 bees, 18 days old. 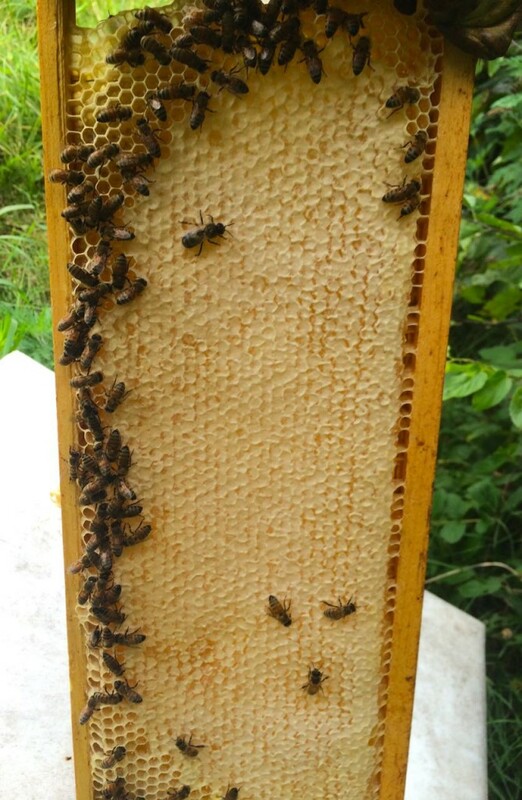 This frame shows excellent pattern and comes from a strong hive. Full box of honey bees at Delvin Farms. 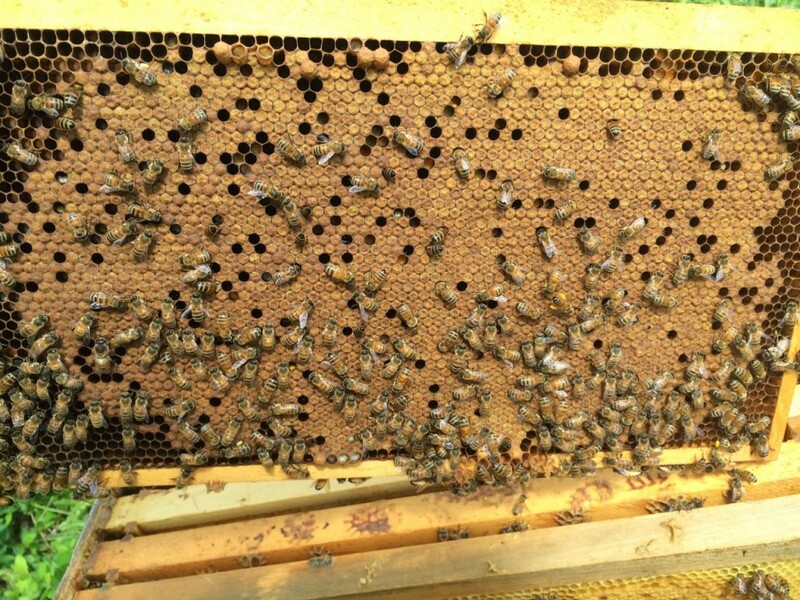 Bees are raised in 10 frame boxes, two boxes deep. Honey supers are added when needed in spring. Full frame of capped honey from 2014 harvest. Spring honey is light color, crisp taste, floral. This entry was posted in Honeybees and tagged honey, honeybees, organic, pollinate, queen bee on April 22, 2015 .